It's the end of another month. I did a decent amount of stash busting this month. Although a lot of it resulted from destashing on Etsy rather than actual sewing. I've come to realize that having too much of fabric just makes me overwhelmed (I know this sounds crazy to a lot of quilters). It was nice to purge those fabrics I didn't see myself using. My sewing style and tastes have changed over the past couple years. I feel as though I'm in the process of refining my stash and making it more usable for my quilting style. I did restock my collection of Pure Elements including some half yards of a few new colors. I was getting pretty low on some of my favorite colors. Other than that I didn't add much to the stash. I had a couple stash busting projects this month. 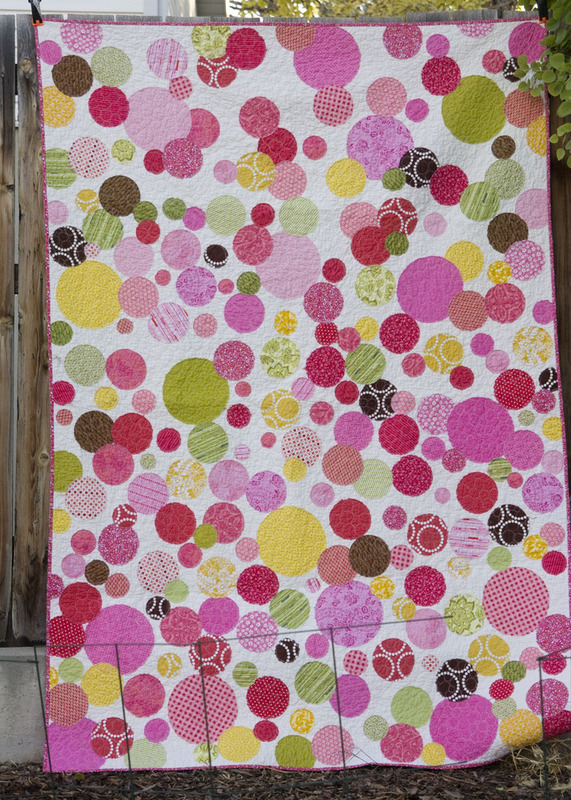 First off, most of the bubble quilt was made from my stash. I bought 1/4 yards of 6 new pinks, but other than that it was all stash. I also began some Christmas/gift sewing. When going through my stash again this month, I pulled fabrics to make some Jane Market bags. I also cut out a few bags using the Oh Fransson's Perfect Zip pattern. I want some bags on hand for gifts including Christmas gifts. I didn't get farther than cutting all these out, but that alone took a lot of time. It was a good sewing related activity when my little guy was recovering from his tonsillectomy. I didn't get much sewing done during his recovery. I'll slowly start working on these as I get time. Pretty soon I'll have about 10 bags on hand when I need a quick gift for a friend. So what have you been sewing from your stash this month? I've been sewing elephants. Lots of elephants! I love your bubble quilt. It's so cool!! Having too much fabric in my stash stresses me out, too! I feel like I need to be using it all up, and there's never enough time!! 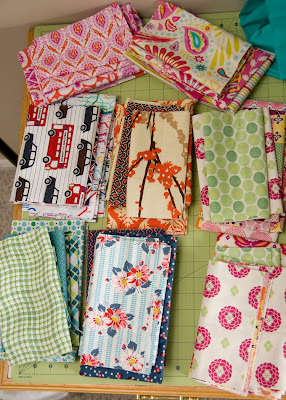 And for some reason, having piles of scraps stresses me out too! I usually just give those away, although I've been using them lately. I don't feel like I got much sewing done this month, due to the exhaustion from FQ Retreat I think! 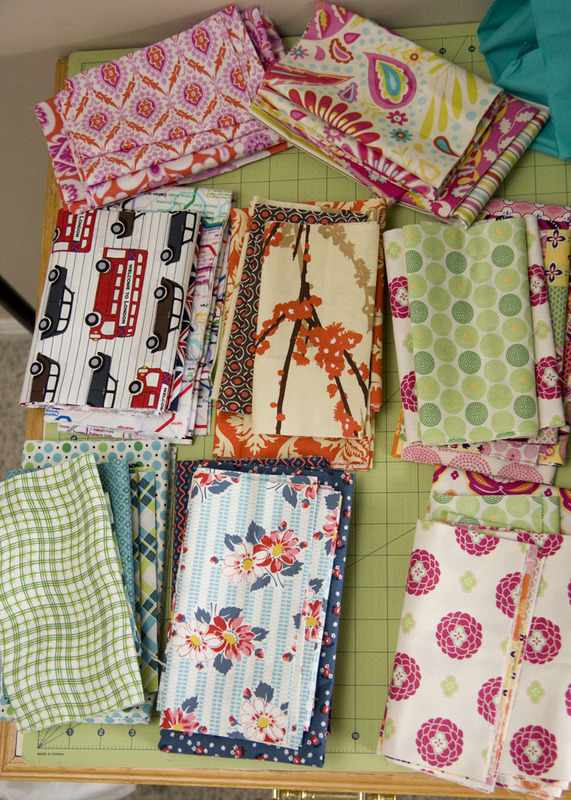 But I've pulled out a bag of stashed selvedges and got sewing and used up lots of scraps for earbud pouches. But whoops I took advantage of a closing down 50% off sale so there will be some additions to my stash when that parcel arrives! It takes a huge amount of time to prep-cut things. The sewing is sometimes the fastest part! That's get you're all set and ahead of the game. Your bubble quilt is AWESOME!!!!!!! My stash is so ridiculously huge that my husband refers to it as "the monster". Yeah, it's taking over everything! What fabric is that in the bottom row centre of your picture? I've seen it on a few blogs and I really love it!